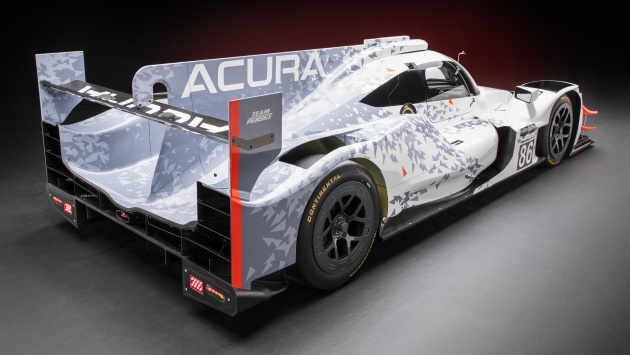 Acura has pulled the wraps off its ARX-05 at The Quail over the weekend, part of the Monterey Car Week in California. The brand new prototype racer from Honda’s luxury marque will be fielded by Team Penske in the Daytona Prototype International (DPi) category of the IMSA WeatherTech SportsCar Championship starting next year, where it will do battle with the likes of the Mazda RT24-P. The ARX-05 (the fifth Acura Racing eXperimental prototype) is based on the Oreca 07 LMP2 chassis, but has been given unique bodywork to better align its design with Acura’s production vehicles, as allowed under DPi rules introduced this year. This includes the distinctive stacked “Jewel Eye” LED headlights that give the racer its aggressive scowl. Behind the driver sits an AR35TT 3.5 litre twin-turbo V6, based on the naturally-aspirated production unit seen in the MDX, RDX, TLX and RLX. The same engine fitted to the TLX GT campaigned at the Pirelli World Challenge Series, it should produce around 600 hp, which is the DPi regulations’ target power figure. The mill is no rookie to sports car racing, having powered class winners at the 12 Hours of Sebring from 2011 to 2013, and the 24 Hours of Le Mans and World Endurance Championship in 2012. Also under its belt are the American Le Mans Series (ALMS) LMP2 titles in 2012 and 2013, as well as overall victories at the 2016 24 Hours of Daytona, 12 Hours of Sebring and Petit Le Mans. Orchestrated by Honda Performance Development (HPD), the multi-year racing effort will kick off at next year’s 24 Hours of Daytona in January. Two prototypes will be fielded, one driven by former F1 star Juan Pablo Montoya and sports car champion Dane Cameron; the other pairing will be announced later. Will it have same results like its F1 sibling? This one will be better! Then Hondasan can flip table and sack their entire F1 team and replace them with Le Mans team. im sure McClaren will approve of it cuz their F1 jepunis minum-tidor-goyang kaki. Sure or not john, have U actually seen any – “jepunis minum-tidor-goyang kaki”. Japanese are one of the most hardworking people in the world. trying to Tipu here isit? !